The program of the conference was intense. Protodeacon Serge Arlievsky, Vladimir Krassovsky, and Anastasia Serdsev: Working with Your Church Choir: Will the “Next Generation” Follow? Kurt Sander: Stepped-Up Self-Education Today: Making the Most of What’s “Out There” for You! We should especially mention the seminar on choral conducting technique, taught by Maestro Peter Jermihov from Chicago, a well-known conductor in North America. The focus of his workshops was on building the liturgical sound in the Russian choral tradition. Spanning the length of the conference, his presentation was divided into three parts: (1) the impact of conducting on choral technique, (2) achieving expressive and prayerful choral tone, and (3) penetrating the conductor’s inner essence. These sessions took the form of a comprehensively conceived and developed master class addressing many facets of applied conducting technique. Five preselected conducting students (all church choir conductors) came prepared to work individually with Maestro Jermihov and to be critiqued in detail for the edification of the conference audience. In this way, they improved their technique and prepared to direct their pieces during Divine services. Peter Nicholaevich held lectures with all participants on the importance of taking a spiritual approach to conducting, with inner contemplation during services, and even during rehearsals. We should emphasize that his seminars were received with considerable enthusiasm. 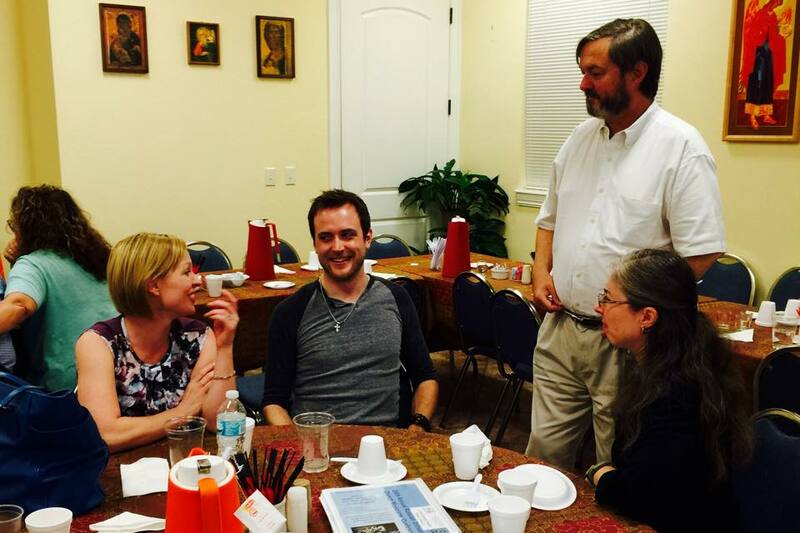 A roundtable discussion was held during which questions were posed about choral endeavors. These conversations gave the participants an experience of camaraderie and mutual support. This dialogue continued between scheduled classes and rehearsals. Everyone was pleased that Vladyka Theodosy actively participated with other members of the conference during rehearsals and lectures. This was very encouraging to the LMC and the conference participants. Mealtimes were an occasion for fellowship among the attendees. In the evenings, singers enjoyed relaxation at the pool, met informally in the reception hall, or explored the local area. A large contingent of young people was present, among whom were choir directors and choristers. 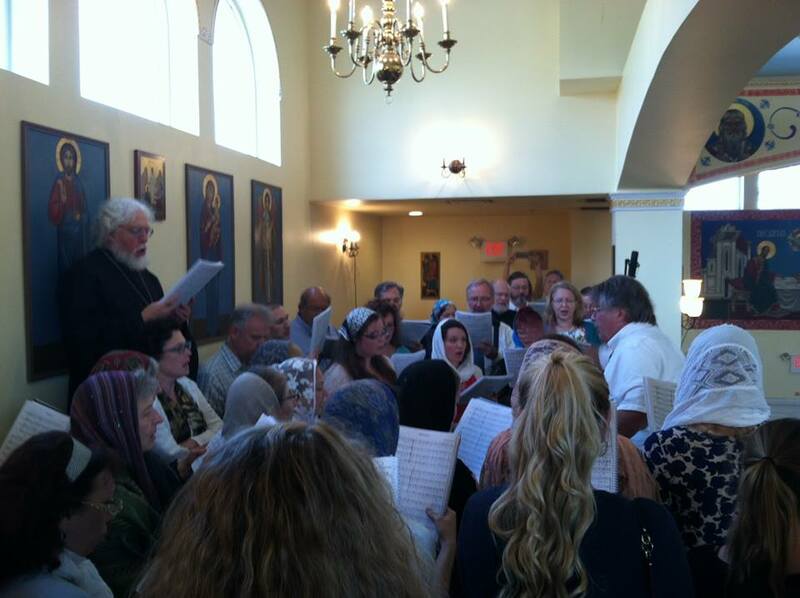 Many of these youth had graduated from the Jordanville Summer School of Liturgical Music, which is run by the LMC and Holy Trinity Orthodox Seminary. The school’s director and Chairman of the LMC is Archpriest Andre Papkov, and the LMC consists of Protodeacon Serge Arlievsky, Vladimir Krassovsky, Peter Fekula, Kurt Sander, George Skok, Nicolas Schidlovsky, and Sergei Chidlowsky. On Friday evening, while the participants enjoyed a night out in Clearwater, the LMC held their annual meeting and discussed an agenda that included preparations for next year’s conference. During this year’s conference, many participants expressed their interest in the historical evolution and status of the ROCM conferences and everything this project has accomplished since its founding in Glen Cove in 1987. 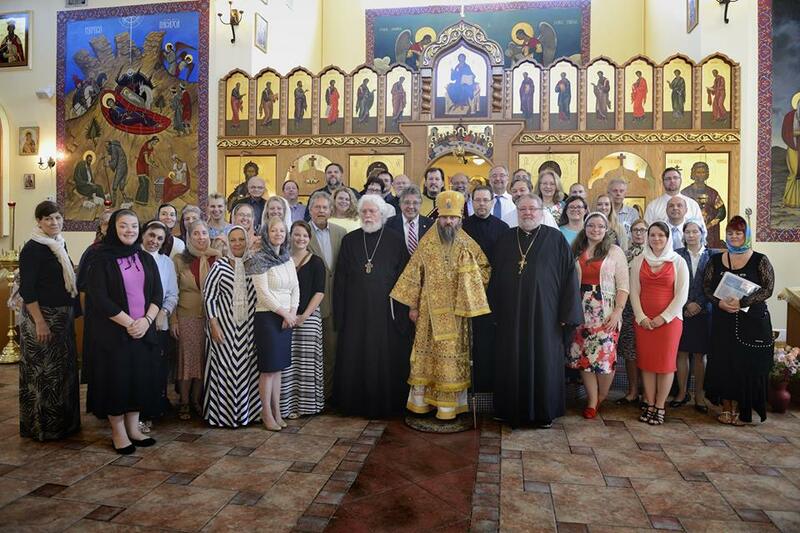 Over the years, the ROCM conference has been enormously successful in awakening the interest and commitment of a whole new generation of Orthodox Church musicians. As a result, the conference can no longer be seen as a solitary undertaking, as multiple other initiatives and ad hoc regional meetings continue to spring up every year in different corners of the United States, Canada, and around the world. The LMC is grateful for the constructive feedback and encouragement it received and is looking forward to auspicious program planning for the coming year. 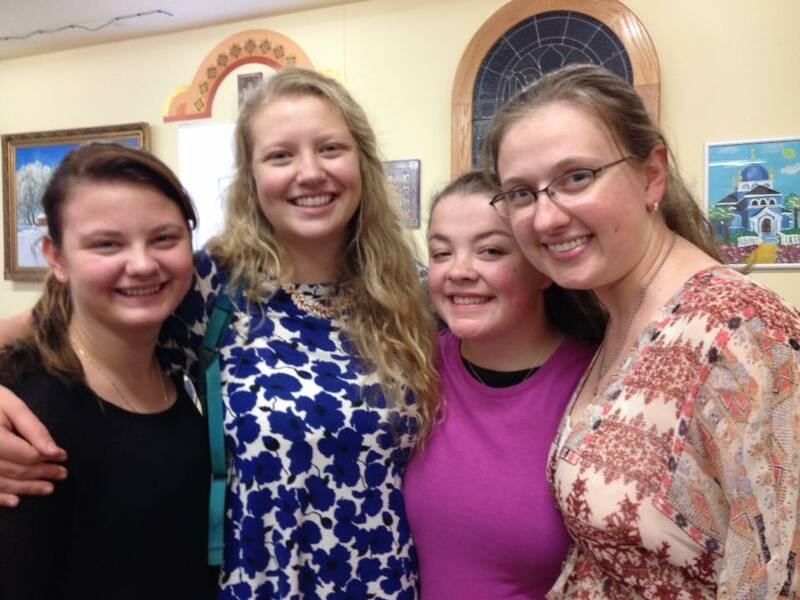 On Saturday night, we all traveled to St. Andrew’s church for the Vigil service. The choir of roughly fifty singers fit comfortably in the choir loft of the new church, which featured magnificent acoustic surroundings. All church services were officiated by Vladyka Theodosy, who himself is very fond of church singing, and who during his time at the Kiev Caves Lavra monastery, was part of their choir. 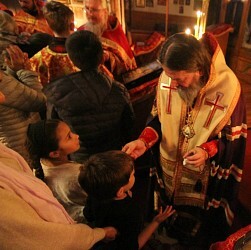 (It is well known that, on occasion, Vladyka comes up to the choir loft of the San Francisco Cathedral to sing Kievan Lavra chant along with the Holy Virgin Cathedral choir.) Archpriest Igor, Protodeacon Serge Arlievsky, and Deacon Igor Tarasov concelebrated with Vladyka Theodosy. After the Vigil, a catered dinner was served, generously donated by a benefactor from the parish. On Sunday morning, a festive greeting and vesting of the bishop took place. 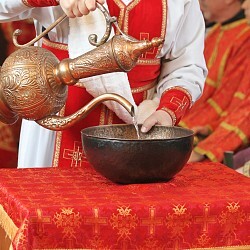 The Divine Liturgy was peacefully prayerful. All the work that went into rehearsing and conducting technique during the conference was evident in the beautiful singing witnessed by those who attended the Divine services. At the end of Divine Liturgy, the thunderous chant of “Many Years,” along with the words of gratitude from Vladyka and Father Igor, warmed the hearts of those present. After the service, the parish hosted a farewell banquet, during which the LMC thanked all the local organizers, presenting gifts to those who made significant contributions: Vladyka Theodosy, Father Igor and Matushka Shitikov, Elder sister Rose Agayev, Music Director Vladislav Markov and Olga Markov, an anonymous donor, Vitaly Macas, Louise Kudrov, Katherine and Alexei Lukianov, Peter Jermihov, and Eugenia Temidis. We wish our Liturgical Music Commission strength, health, patience, and vitality of spirit for their further efforts in the field of church music. Next year, God willing, we will all meet at the 25th Jubilee ROCM Conference, which will be held at St. Nicholas Cathedral in Montreal, Canada. "From a young age, Papa instilled in us love for our Faith and the Church. "